I usually have bigger ambitions than I actually have time for. It's kind of hard not to.... there are so many great ideas out there! I lovingly call the internet, "The Vacuum." My husband couldn't agree more. How many times have I said, "OK, I'm finishing up.... I just need to look at one more thing" only to find myself still there..... googling and clicking my way to happiness. I usually have grand ideas for Halloween treat bags and then time gets away from me and those good ideas get filed away for another year. But this Halloween I vow to help the kids make special treats for their friends. And maybe if I say it here, that'll keep me on the straight and narrow. No turning back once you say it out loud, right? So I did a little research, gathered a few ideas and thought you might enjoy them, too. 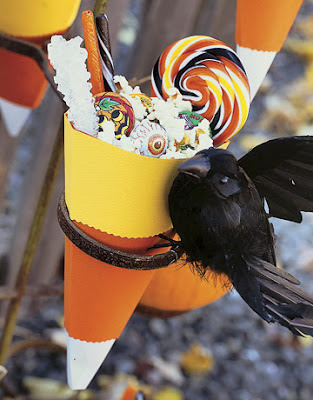 These were one of my favorites -- I love these candy corn cones from Country Living. I can see these on a Halloween party table filled with caramel corn and candy corns. They would make a good teacher's gift, too. Just wrap them in cellophane and add a little ribbon. Cute, cute! 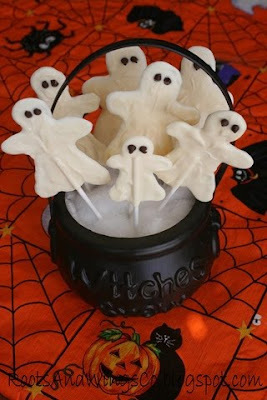 White chocolate ghost suckers from Roots and Wings would be a perfect treat individually wrapped for kids' classrooms. Pretty simple to make and you can find all the instructions on their website. I sooooo want to make these! That's one creative momma over at Then She Made -- look at this adorable treat box. "I've got my eyes on you!"..... how cute is that? And Amy made it by using a large tater tot box from Sonic as her template. 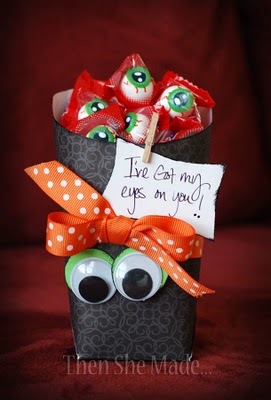 You can't go wrong with googley eyes when making things for kids! Mix, Mingle and Glow has a great tutorial on these Halloween Haystacks, although they look a little more like witches' brooms to me. 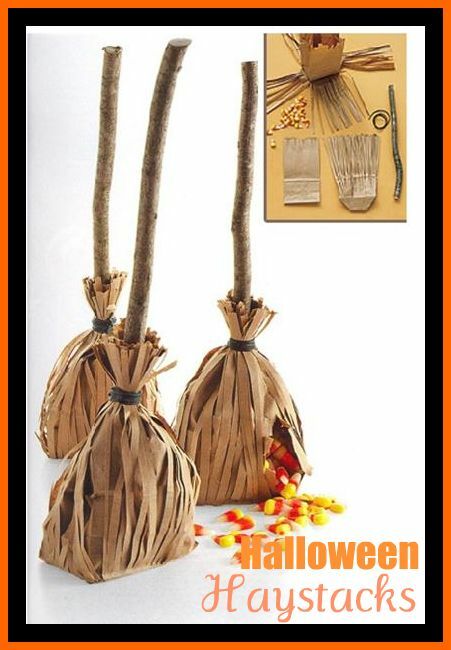 Super cute and you could make them in small sizes with small paper bags for class treats. The possibilities for fillings are endless. 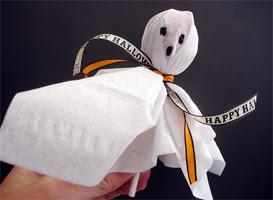 And we can't forget the tried and true tissue paper Ghost Pop, made with a Tootsie Roll pop sucker -- always a hit and EASY for kids to make themselves. Here's a quick how-to if you need some instructions. 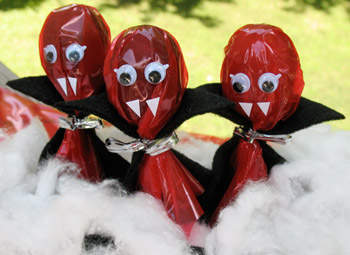 Another twist on the Tootsie pop idea -- These vampire lollipops from Kaboose would make my son so happy! I can just see the smile on his face right now as he brings a basket of them to his friends at school. Perfect for boys and easy to make, too. 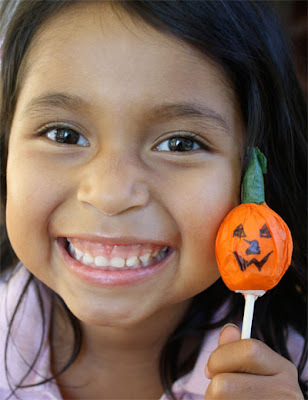 Or change it up a bit this year and make a pumpkin tootsie pop from Skip to My Lou. A little orange tissue paper, a black marker, some floral tape and a tootsie pop and you have a treat they'll love to make for their friends. With all of these cute ideas for inspiration maybe we can all make something a little extra special this Halloween for our kids' friends. 3 kids..... 3 schools..... 60+ treats.... here I come! !